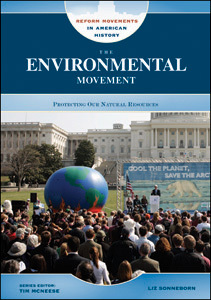 The Environmental Movement introduces readers to this significant movement, which arose in the United States in the late 1800s in response to the nation's dwindling forests and the pollution caused by a greater number of factories. The abundant photographs and vibrant text chronicles the accomplishments of conservationists such as Gifford Pinchot and John Muir, who helped the movement gain a foothold in the United States. This useful book also details how environmentalism has become a global effort, led by organizations such as Greenpeace and the World Wildlife Fund. Full-color and black-and-white photographs. Sidebars. Chronology and timeline. Bibliography. Further reading. Index. Liz Sonneborn is a writer living in Brooklyn, New York. A graduate of Swarthmore College, she has written more than 50 books for children and adults, including the Chelsea House titles Vietnamese Americans in the series The New Immigrants and The Electric Light in the series Milestones in American History.